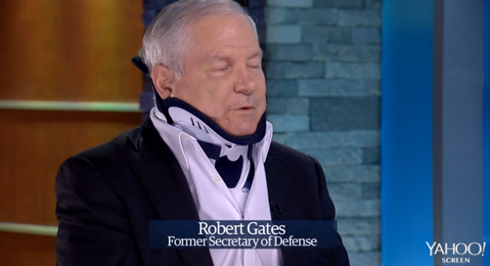 Katie Couric made her debut on Yahoo!’s video channel today, with an interview with former defense secretary Robert Gates that originated from a simple and rather poorly lit sit. The set features a blue printed background with flat screen placed in the center and a faux stone column with wood toned paneling accented with silver reveal lines. 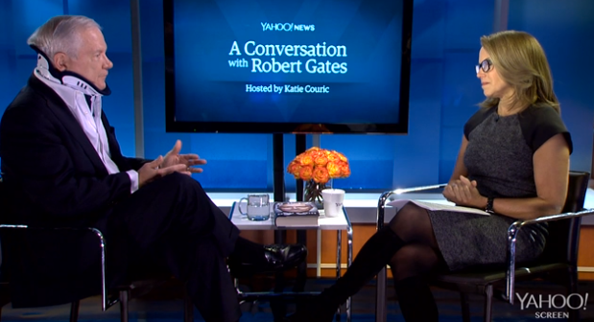 The one shot on Couric, which was used sparingly in the interview, gives a peek into the scale of the set. Couric appears to be seated very close to the wall — so close that she casts a shadow on it and much of the surface gets washed out by the light. Lighting problems continued on Gates’ side of the set, especially with the faux stonework — typically this material provides a great opportunity for showing off its texture with careful lighting design. That said, the wood wall on this side of the set does appear to have some subtle accent lighting that adds some warmth to the background. In future interviews, if this set will continue to be used, Yahoo! should definitely investigate some better lighting design to give Couric’s segments more of a professional, polished look viewers are used to seeing her in.